During the last year I've executed a field test focusing on bushcraft activities. In the Bushcraft Knife Test 2015; 15 different robust knifes are compared to each other. You can see the test by clicking HERE. 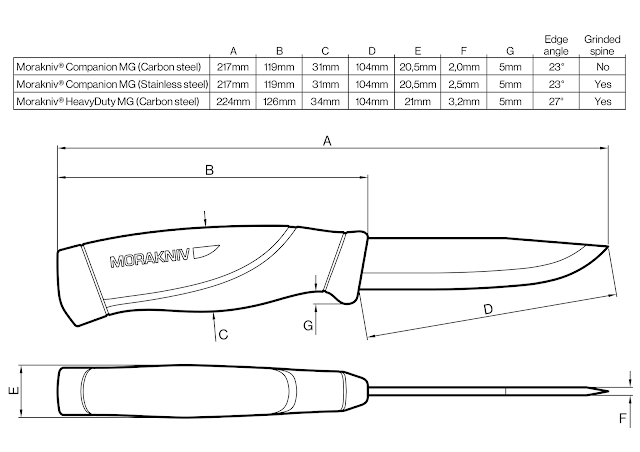 One of the test's contenders was the Morakniv Companion Heavy Duty MG, which we now shall look a bit closer at. If you'd like to read more about the Morakniv history I'd like to recommend you to take a look at one of my earlier magazine articles by clicking HERE. 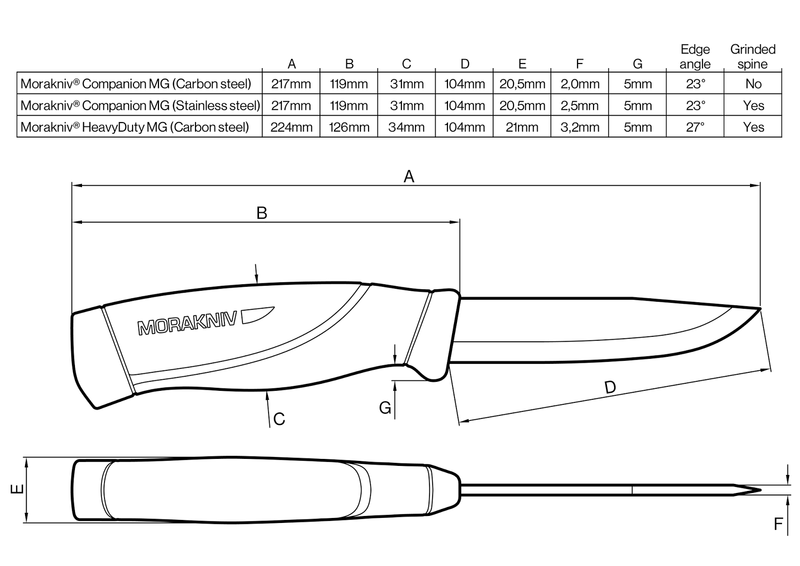 Around 2010 the Morakniv Clipper was a big hit among the world's bushcraft enthusiasts. The legasy of the Clipper then lived on in the Craftline and the Companion with somewhat more sturdy specs. The knives got along very well both with craftsmen and outdoor people. However the bit more rougher bushcraft audience brought out the big cake once the more robust Companion Heavy Duty was launched. The biggest differences within the Clipper/Craftline/Companion lineup is the blade thickness and the shape of the tang. The Clipper had a 2 mm thick blade with a short tang. Craftline HighQ and TopQ festured a 2 mm thick blade with a long tang. The Companion uses a 2,5 mm thick blade together with a long tang of an updated shape. The blade of the Companion Heavy Duty is 3,2 mm thick and the edge has a 4° wider angle (27° instead of 23°). Also the handle of the Heavy Duty was beefed up. The 100 mm long carbon steel blade was made a bit tougher by applying the logo on the side of the blade using etching instead of punching. This to eliminate the risk of fracture indication. Besides the Military Green (MG) the knife also comes in orange. All knives in the Clipper/Craftline/Companion lineup uses the same plastic sheath, just different colors. Top down; Clipper 840, Craftline HighQ Allround, Companion and Companion Heavy Duty. I like the Clipper/Craftline/Companion family for their versatility. Great knives for the workshop, in the car, in the woods and when out hunting. During my bushcraft knife test I was truly impressed with the blade of the Companion Heavy Duty. To be honest I thought this knife would place it self higher in the total score of the test, but the sheath together with the, in my opinion too fat, belly of the handle lowered the score somewhat. Therefore the Companion Heavy Duty ended up at a strong 4th place compared to the other 14 knives. I prefer the more slimmer handle of the regular Companion and the plastic sheath, as practical as it is, had a tough time competing with the beautiful leather works of the competitors. I can truly recommend the Companion Heavy Duty to anyone looking for a price worthy roughneck forest knife with great whittling abilities. 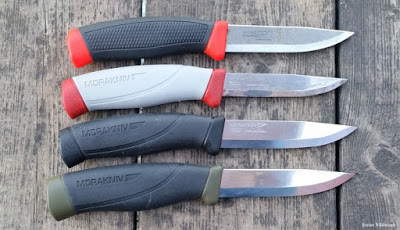 Other post I've published about Morakniv's products; you can find by clicking HERE.